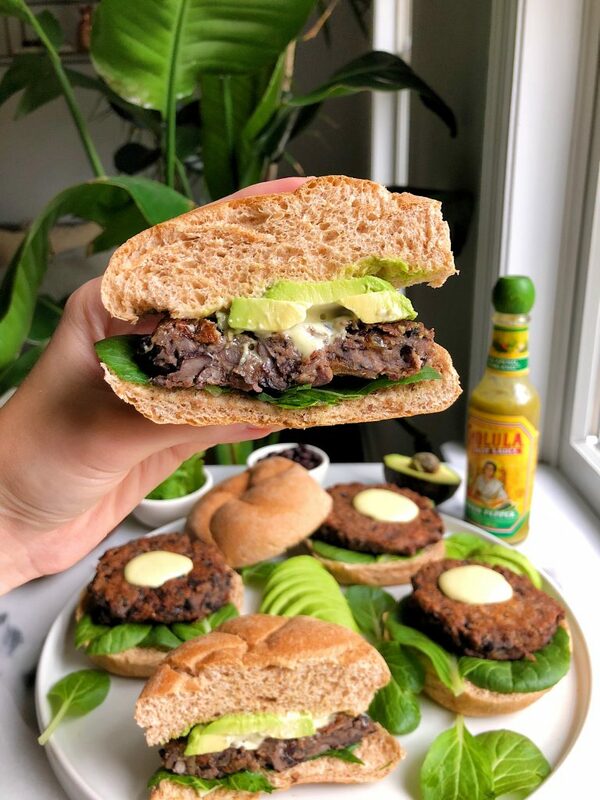 Super easy and delicious homemade Vegan Black Bean Burgers with Spicy Aioli for a simple and healthy veggie burger recipe! There was a time (not too long ago), when I would eat veggie burgers pretty much every single day. They were a staple in my freezer and I just love how convenient and easy they are to whip up. I do cheat often and buy ready-to-heat veggie burgers from the freezer section in the grocery store, but I also love making my own homemade ones as much as I can. 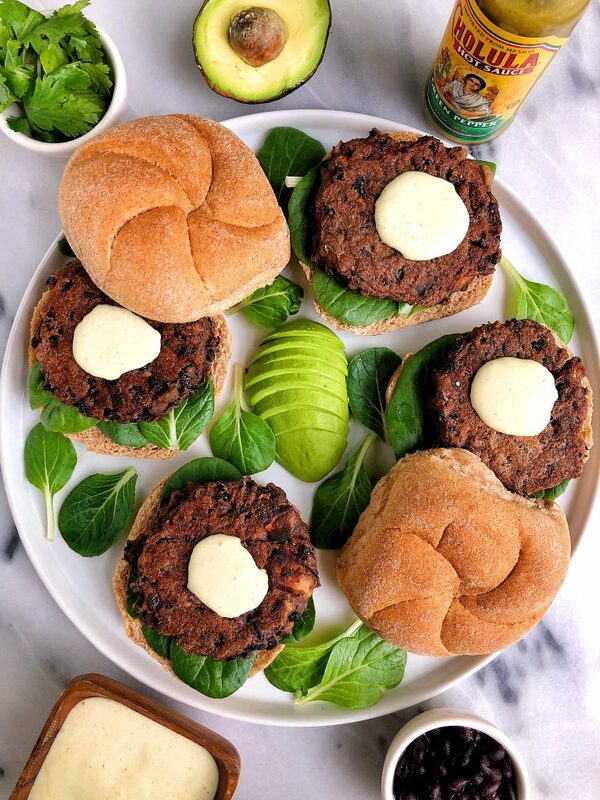 These Vegan Black Bean Burgers are my absolute favorite homemade veggie burger. They are so easy to make (almost too easy) and they are so flavorful, satisfying and they are only made with a few ingredients like sautéed onions, mushrooms and oat flour. I pair mine with a spicy aioli that is made with just two ingredients: vegan mayo (or regular!) and Cholula® Green Pepper Hot Sauce. It is that simple friends. These burgers are the best to add on top of a salad, mix into an omelette or enjoy with your favorite bun and toppings. I love adding some avocado on top, the spicy aioli and some extra Cholula when I want that extra kick. Cholula Green Pepper Hot Sauce has a burst of jalapeño and poblano peppers mixed with some spices. It goes deliciously with pretty much anything. You can add their hot sauce to salads, in dips, marinate some chicken in it, anything! 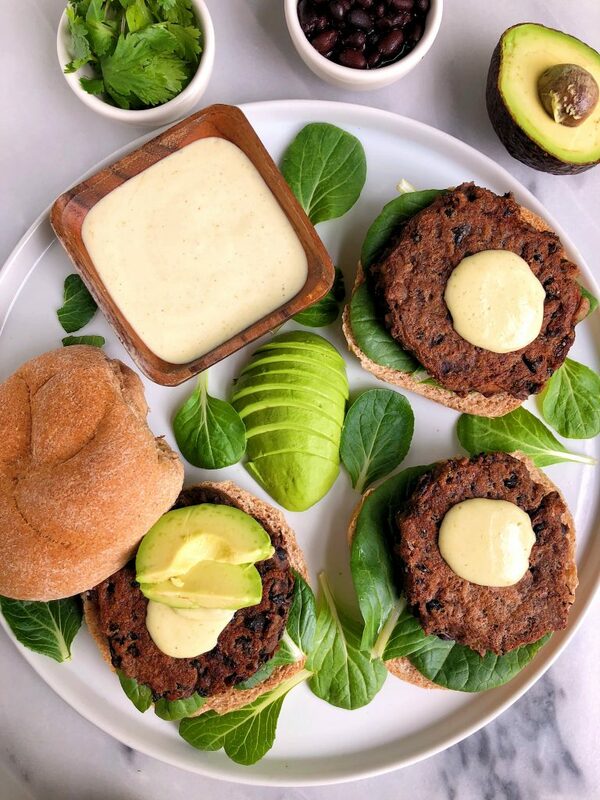 I hope you guys love these Vegan Black Bean Burgers with Spicy Aioli as much as I do! Don’t forget to share with me on Instagram when you make them at home. I also have a few other veggie burgers here on the blog like these Whole30 Veggie Burgers and Brussels Sprouts Falafel Burgers! Mix the mayo and Cholula Green Pepper Hot Sauce well then add on top of burger with bun and toppings of choice! Store left burgers and aioli in the fridge for 5 days or freeze the burgers for longer! Thank you Cholula for sponsoring this post! It means so much to me to work with brands I love and believe in here on the blog. Love how these are made with staple ingredients I already have on hand! Hi! Thank you for sharing this recipe! I can’t wait to try it. Whenever I have made bean burgers in the past, they always crumble when I put them on the skillet. I’ve tried forming them into patties and putting them in the fridge for a couple of hours, dried out the beans before mashing them, etc. what are your suggestions of what I’m doing wrong. I would greatly appreciate it! Thanks again!!! Unique recipe for Burger! Hope it will be yummy. Will try soon. These were great, but the only thing was that I had to use a large amount of oil. I don’t like using oil when cooking, but I found that these burgers were very sticky and started to burn so I had to use more oil. Great taste though! Love the basic ingredients! Can you sub a regular egg for the flax egg? i haven’t tried but i think it would work!